The Royal Borough of Kensington and Chelsea combines two to the most charismatic areas of London. Each has its own colourful history, distinct and separate from the other, despite having shared a common boundary for centuries. In this book Annabel Walker describes the social and architectural histories of each village. Both are rich in fascinating buildings and famous inhabitants. 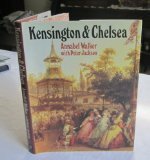 Engravings, maps and photographs, mostly from Peter Jackson's unique collection, illustrate how Kensington and Chelsea developed from small villages to become desirable suburbs and then part of the great metropolis.